So Adorable! 🙂 Love these! Thanks for your interest Alessandra but unfortunately, we do not make them for sale. hi ! 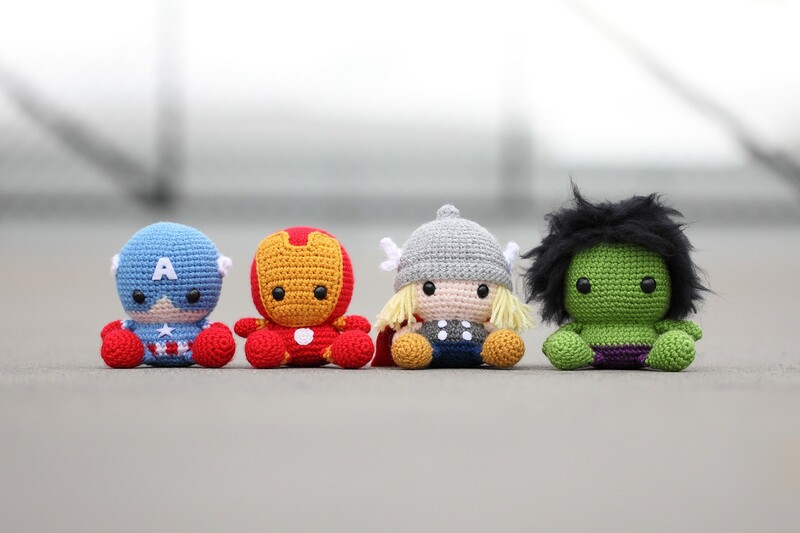 I’m in love with your avengers and i would love to crochet them for my boyfriend. Do you have a tutorial that i could use? Thanks for your comment MademoizelleCoco but unfortunately we don’t have a tutorial. Looking to buy the avengers pattern, I can’t see it in your Etsy shop though…Do you offer it for sale at all? so you have avengers patterns for sale ? Sorry guys these patterns are not for sale. All the patterns we have for sale are listed in our Etsy shop. These are way too cute not to share. Will you be sharing the pattern with us soon???? Yes, are you planning to sell patterns for this avenger set? I would love to make these for my lil one. Sorry guys, these patterns are not available for sale. May I ask what you used for The Hulk’s hair? Wool felt was used for the Hulk’s hair. What do you use as Hulks hair? They are adorable! Is there a pattern for The Avengers? They are adorable. Sorry Emily, we do not have these patterns available for sale with no plan on offering them for sale at this point in time. The patterns that we do have for sale can be found on our Patterns page. I love the hulk hair! How did you create the hulk hair with wool felt? With glue? @Liena: Hulk’s hair is made from wool felt and is attached to the head with a felting needle which has very sharp, barbed blades on them. How did you get the wool felt Look like that? Also with a felting needle? @Liena: The felt wool comes like that. They’re so cute I would love to make them for my grandson. I would like to buy a pattern from them, how can I get it? Sorry Anna, but these patterns are not available for sale.